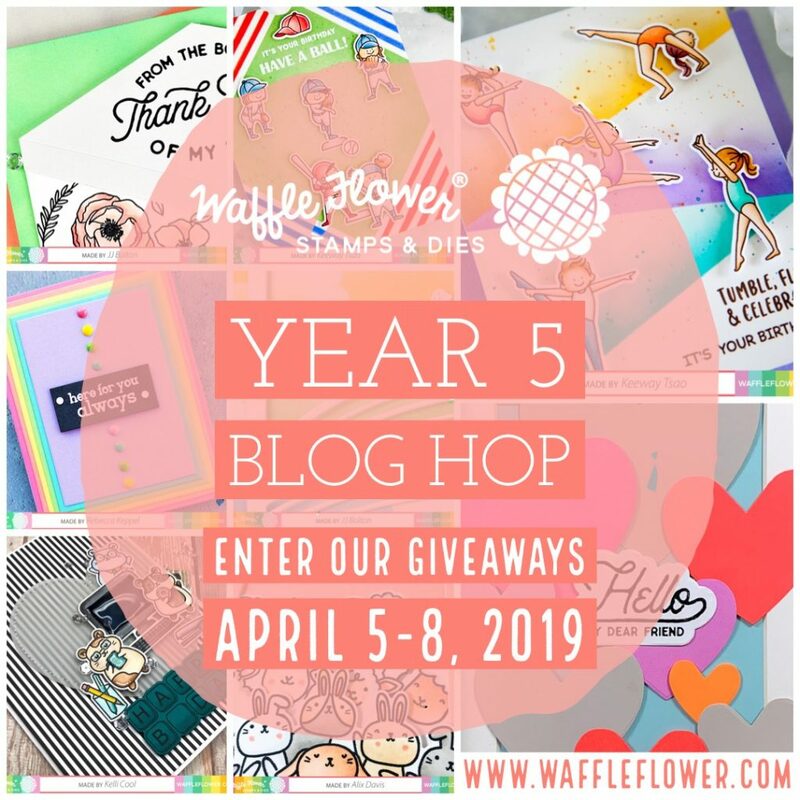 Welcome to Waffle Flower April Release and 5th Birthday Blog Hop! 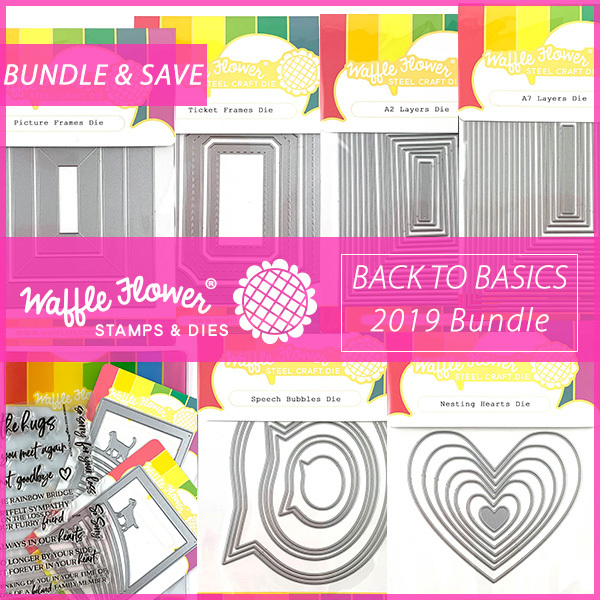 We got new stamps, you’ve already seen at creativation stamps and Back to Basics Dies this month. I’ve made four cards to take you to a little tour of this month’s products. How many of your kids are doing sports? This stamp illustrated by Kamo is so adorable. 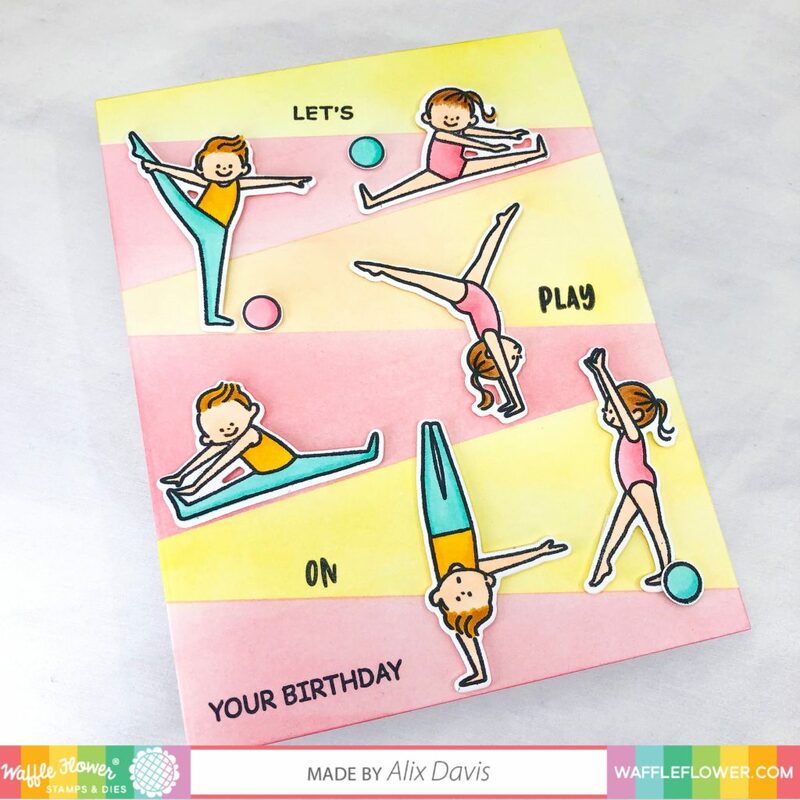 It is very easy to make a birthday card or a deck of Gym party invitations out of it. To start with, I stamped images from Tumble On stamp set and cut with Matching dies. Then I colored them with copic markers. You really don’t need to use lots of colors to blend since the images are cute enough to work with. I created the abstract patterns using washi tapes to mask the A2 sized watercolor paper and ink blended with Tim Holtz Distress oxide ink in Squeezed Lemonade and Worn Lipstick. 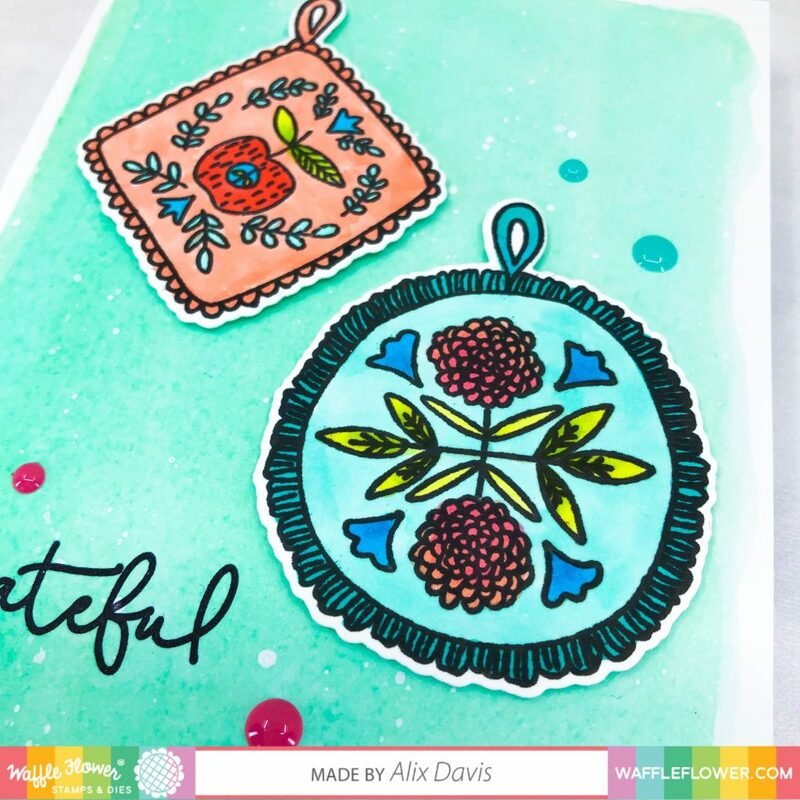 I arranged all colored images along the pattern I created and stamped the sentiments to finish my first card. Mother’s day is approaching. Giving a card with unique and interesting pattern would be a great idea. First, I mixed Tim Holtz Distress oxide ink in Cracked Pistachio with water, then I applied it onto a piece of A2 sized watercolor paper using medium sized paint brush to create my background. To make it textured, I splattered some of water paint over it and let it set aside to dry. At the meantime, I stamped selected images from Grateful stamp set with Memento Tuxedo Black ink over Neenah Solar white 80lbs card stock paper and colored with Copic markers. I die cut them with Matching dies and adhered onto the background with Foam squares. At last, I stamped sentiment “Grateful” to the lower left corner of my card and added enamel dots from Up & Running Enamel Dots to finish. April marks the beginning of baseball or softball season and we are ready to hit one out of the park with this fun stamp set. I decided to make this card simple enough to duplicate. 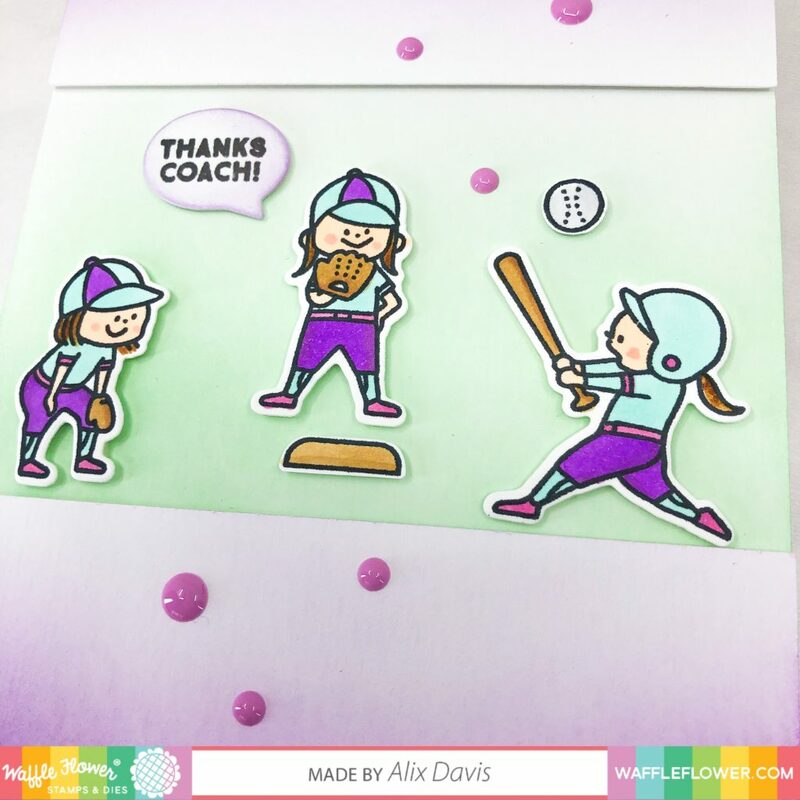 Since my daughter is a softball player, I made a softball coach Thank you card. To make my background, I ink blended the background with Tim Holtz Distress oxide ink in Cracked Pistachio. Then I cut out 2 pieces of wider strips to adhere onto top and bottom of my background so I would have a stage for soft girls to stay on. To create some dimensions, I did add some foam strips underneath after I ink blended with Distress oxide ink in Wilted Violet. 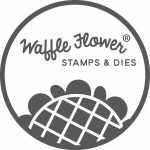 I stamped out my images from Batter Stamp set and cut out with Matching Dies. Then I colored them with copic markers and added to my background. I cut out a speech bubble from Speech Bubbles Die and stamped the sentiment “Thanks coach” in it before I adhered it. I found these purple color enamel dots from Up & Running Enamel Dots which matches so well with the girls’ uniform color so I popped some of them around the frame to finish my card. 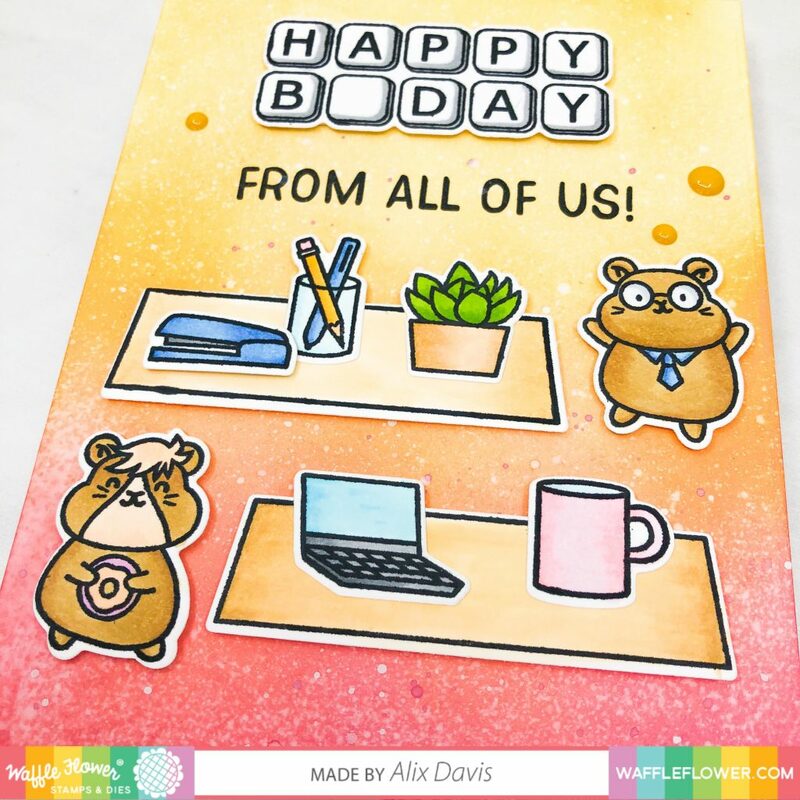 For my last card, I used these the cutest hamsters celebrating their co-workers in Office Birthday. I got back to my all time favorite ink blending background technique this time. I ink blended my background using Tim Holtz Distress oxide ink in Mustard Seed and Worn Lipstick heavily. I then sprayed water over the background and dried it with a piece of paper towel. I stamped my images from Office Birthday Stamp Set with Memento Tuxedo Black in and cut with Matching dies. Then I colored them with Copic markers and arranged onto the background using Multi Medium Matte and Foam squares. I stamped sentiment ” from all of us!” and embellished my card using purple color enamel dots from Up & Running Enamel Dots . Now you know this enamel dots set is so come in handy for all color matching requirements! This release covers so many areas I don’t have stamps for. Pet’s death, kids sports, office! Your creativity blows me away. I like the way you set the cute little gymnasts on the diagonal. I have an obsession for the softball and gymnastic sets! 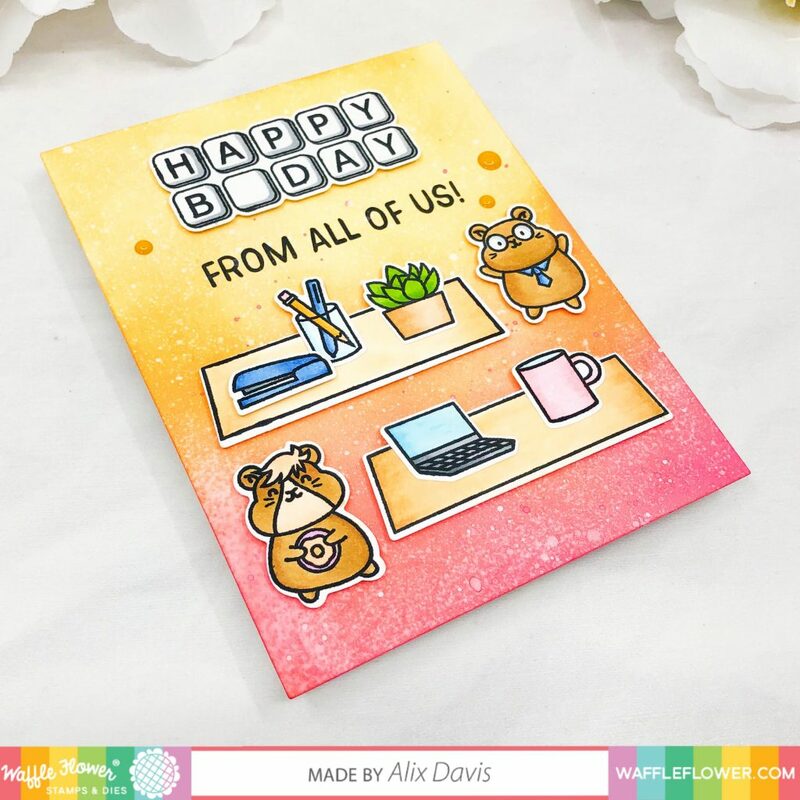 Your cards are so adorable and full of ideas. I love the lavender and mint for the softball card. I LOVE THE POT HOLDERS! They look Nordic, which I ADORE!! Love the baseball stamp. Great release. Super cute cards. Thanks for sharing. Great cards, and really love the watercolor backgrounds! Alix I love your cards! What a fun collection of cards! Such sweet creations! I love the baseball players and gymnast soooo much! Fun, beautiful cards. The colors and the coloring are amazing. 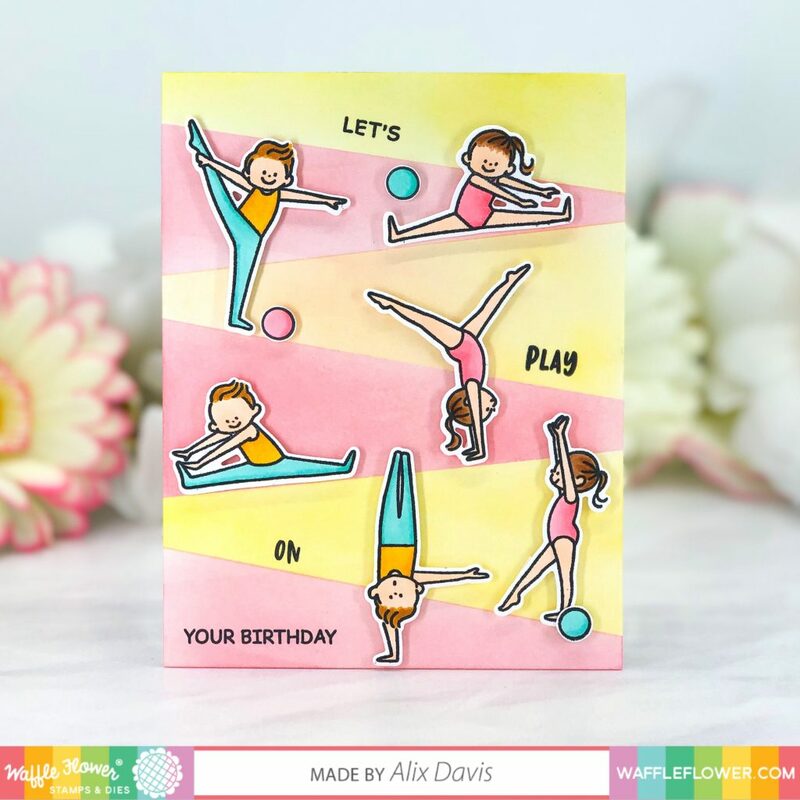 Fun and happy cards. I love the cards from this release. Adorable cards. I love those sweet hamsters! Such colorful, happy cards. So hard to pick my favorite but the office is really tugging at me. Thank you! Wonderful cards! 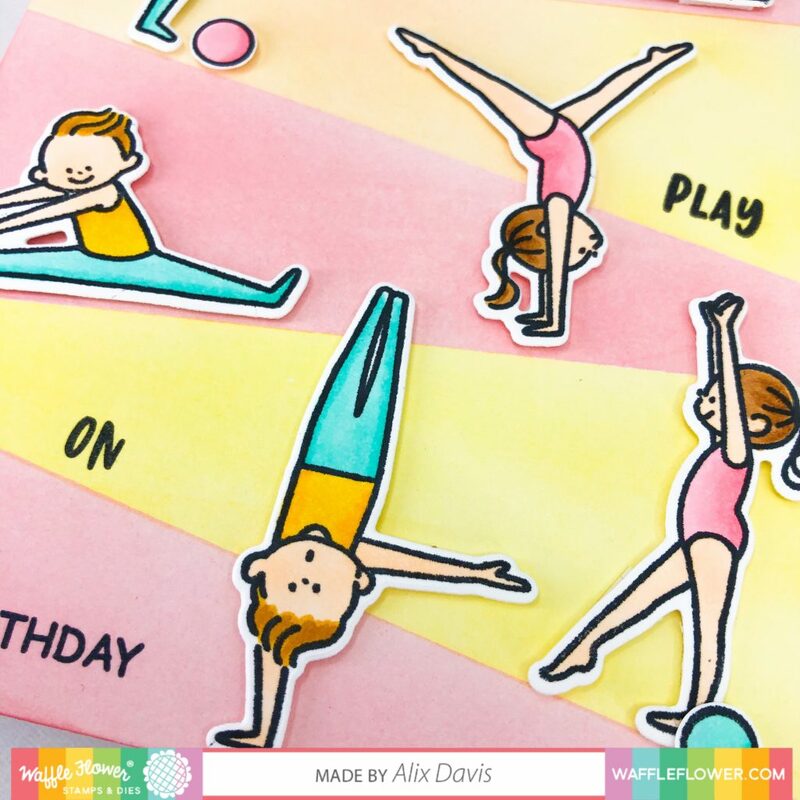 Those little gymnasts are just adorable! The hamsters are so fun! 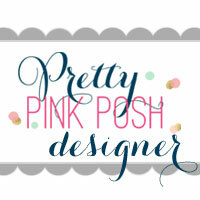 Great new designs! So many delightful projects! I really like your little baseball scene, partly because I’m so enamored with the baseball set. But really, all of these cards just make me happy. Thanks for sharing! Your cards are just so fun. Great selection of cards highlighting the new release! Your softball card is my favorite. It’s such a cute little scene and those colors are fabulous! Your cards are really amazing!!! Fabulous colouring!!! Love them!!! Oh my goodness. All of your cards are so sweet It’s hard to pick a favorite. I really love the Grateful card and the Tumble On card. So pretty. So many fabulous cards to show off the new sets! I really like all the gymnastics cards and the purple softball one. The baseball set is so adorable! I can’t get enough of those faces. I love all of your cards! The gymnast background is awesome! I loved you cards with the beautiful colors. Wonderful variety of cute cards. 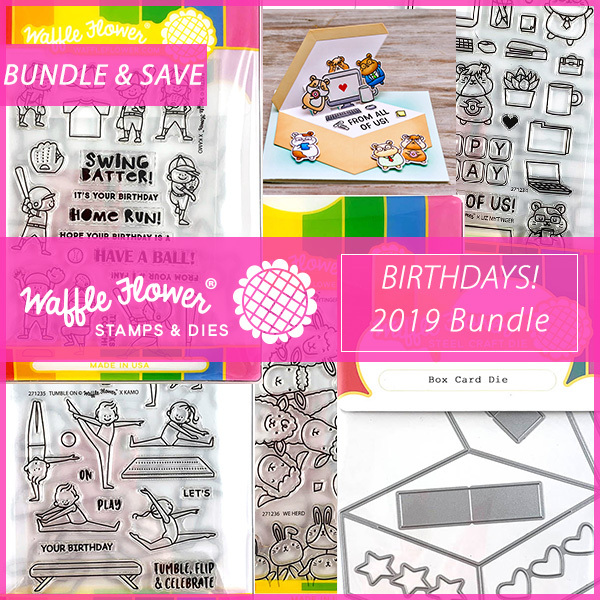 You’ve made some really cute and fun scenes with these stamp sets. I really like the softball one and the school supply one. both of these activities so well. Awww, Alix, how cute, all of them! Love all of your cards, are are so darling! 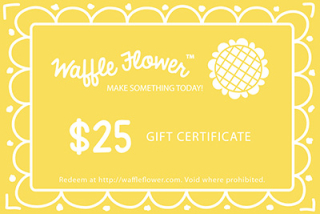 I love Waffle Flower images, especially those kids are so cute! Great card showing so much of the new release! All of your cards are incredible!! Great coloring!! The kids are adorable. I hope it’s not too late, loving all these cards, stationeries, tags, etc…pretty pretty, pretty….